Finding a good nail lacquer/polish, that gives opaque coverage on the first application is a task too just like finding a good foundation. It's been over 4 years I've started using Sweet Touch polishes, and have reviewed with NOTD's quite a lot of time on my blog too. Sweet Touch nail polishes have never disappointed me, in terms of packaging, application, coverage and staying power - since the time I've started using them. Earlier the applicator was thin, compared to the thickness now. The formula is still the same. Now it's thicker with a curved end to make application easier as well as quicker. They have come with numerous colors for all the season and liking. 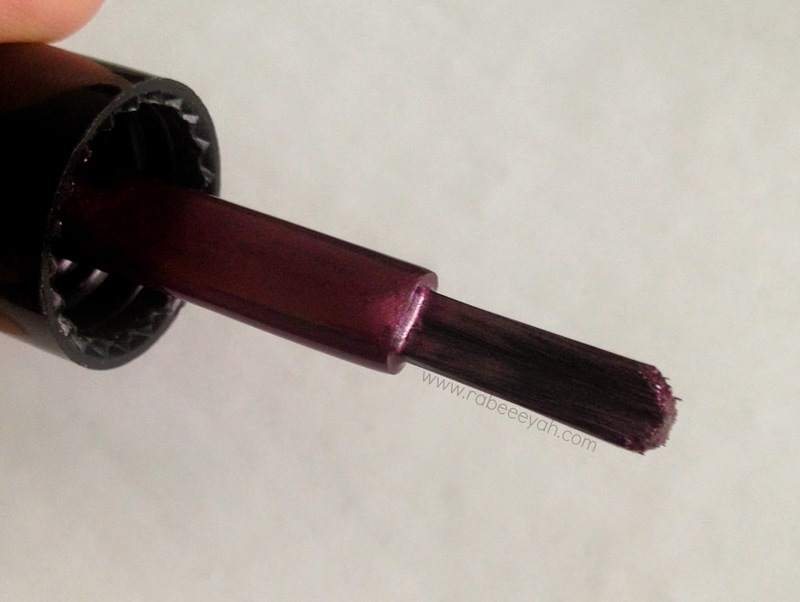 Neons, neutrals, bright, bold, deep colors, glittery and the best part, magnetic. 1- Apply thick coat or two coats of nail color. 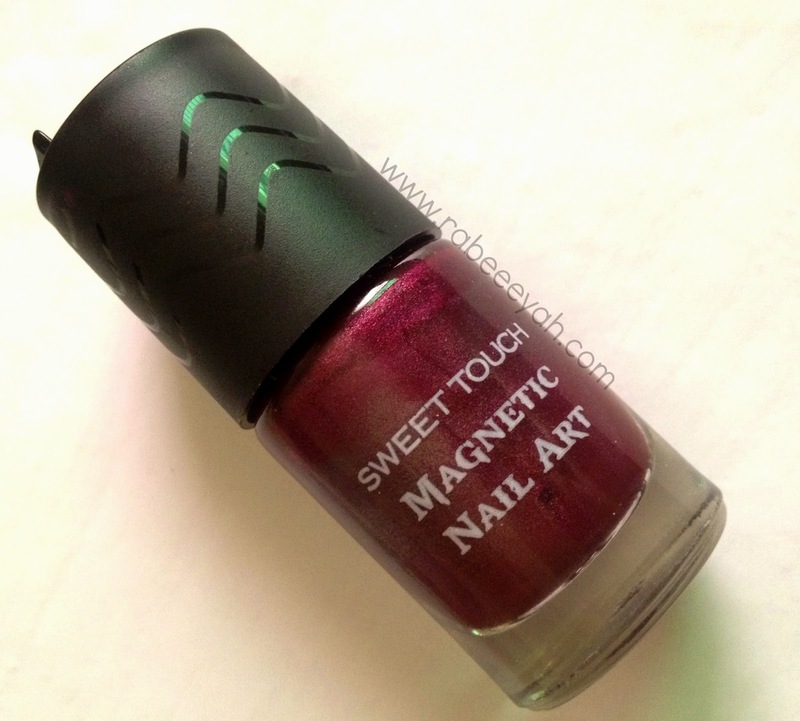 2- When the nail color/second coat is wet, use the magnet cap that comes with the bottle and place it over the nail. Not too close, not too far. 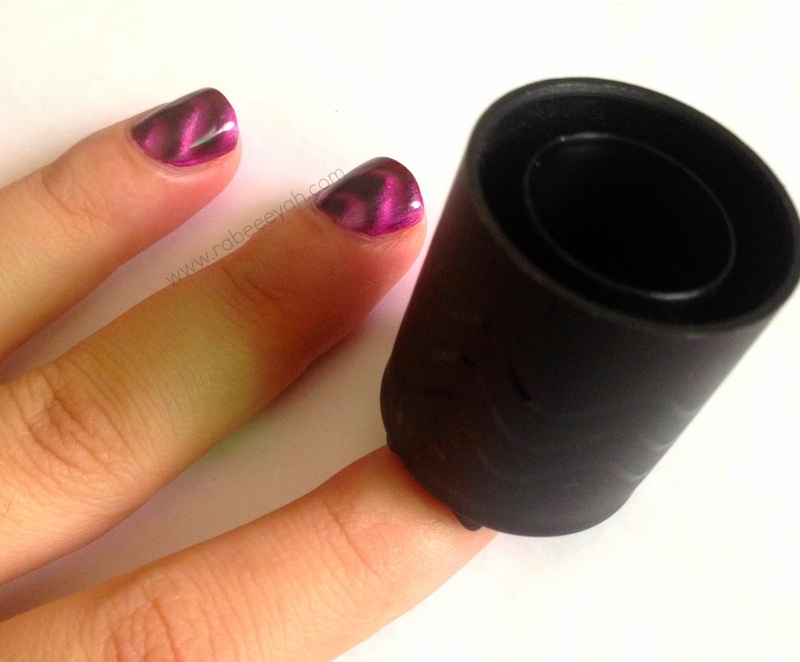 It has stand made to help keep your hand stable and the magnet away from the nail. Hold the cap, don't keep it over the nails. 3- Keep it over it for 30-40 seconds. 4- Remove it, and voila, you have a pretty & effortless nail art done. 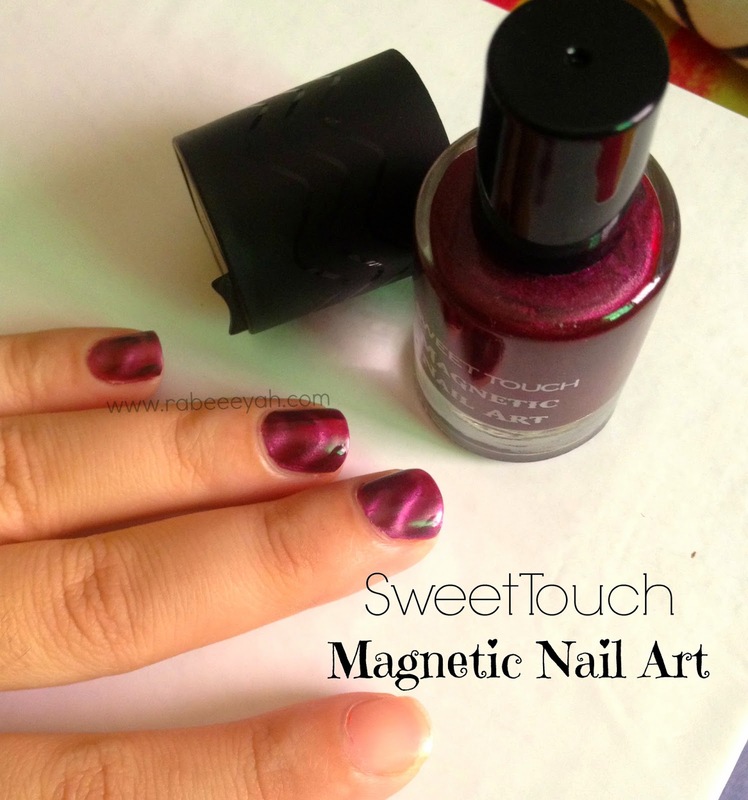 Let's talk about the pros of Magnetic nail color; it is two in one, one can use this nail color with or without using magnet. You can play with it in different fashionable ways. Another good thing is the staying power, it doesn't chip even if you use without top & a base coat (which I don't normally use). Compared to the other brands, the expensive ones, Sweet Touch nail colors stay put and doesn't chip for at least 4-5 days. To add one more pro, it dries fast as well. As for the cons, umm if I really have to add one it would be a few more colors that should be added in Magnetic range. Apart from that, there are no cons in terms of price, availability, quality, staying power. Availability: All the leading supermarkets & cosmetic shops. Like Sweet Touch on Facebook for all the updates! 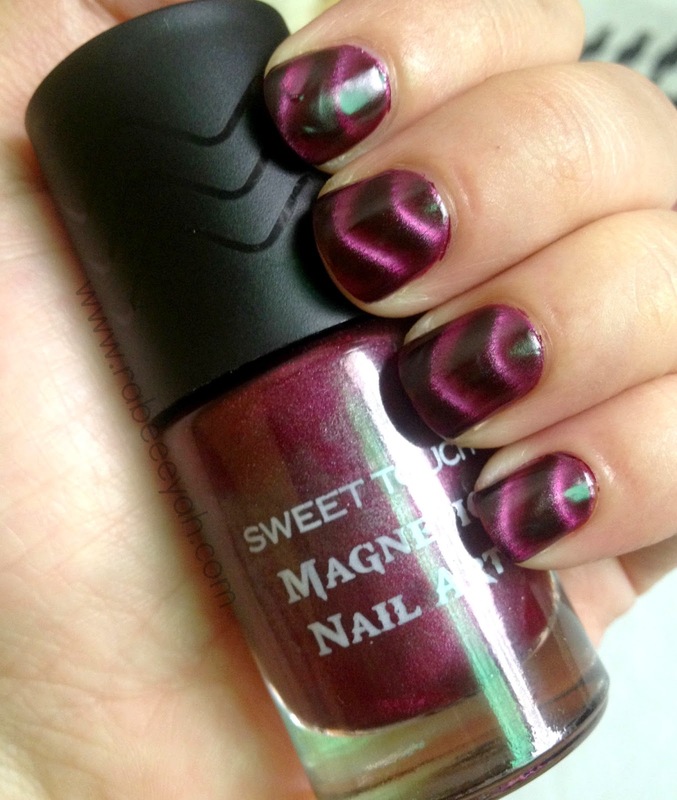 Have you tried Sweet Touch nail polishes? What are your views on them? Looks so pretty on your nails.